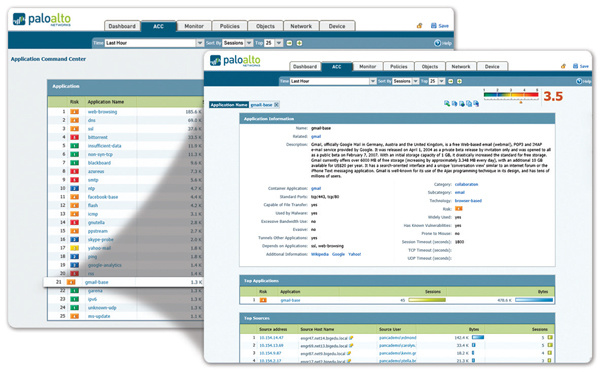 The centralized management features in Panorama will minimize the administrative efforts and operational costs associated with your deployment of our next-generation firewalls in multiple locations – either internally or globally. 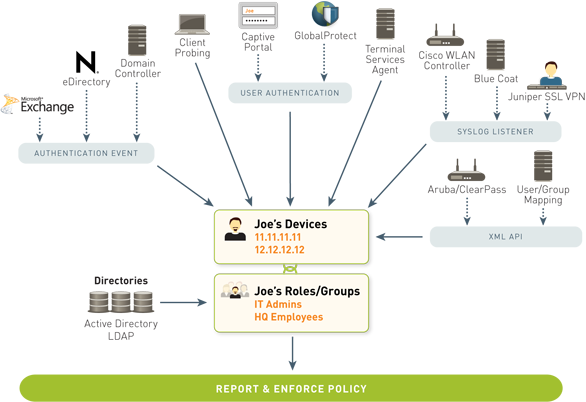 Panorama allows your team to centrally manage all device aspects including configuration and policy deployment, visibility into applications, users and content as well as logging and reporting. Protest against all threats—both known and unknown. Prevent known vulnerability exploits, malware, spyware, malicious URLs while analyzing traffic for, and automatically delivering protection against highly targeted and previously unknown malware. 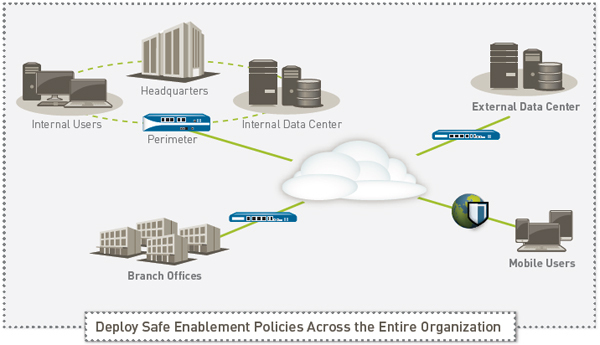 Safe application enablement policies can help you improve your security posture, regardless of the deployment location. At the perimeter, you can reduce your threat footprint by blocking a wide range of unwanted applications and then inspecting the allowed applications for threats— both known and unknown. In the datacenter – traditional or virtualized, application enablement translates to ensuring only datacenter applications are in use by authorized users, protecting the content from threats and addressing security challenges introduced by the dynamic nature of the virtual infrastructure. Your enterprise branch offices and remote users can be protected by the same set of enablement policies deployed at the headquarters location, thereby ensuring policy consistency. Classifying all applications, across all ports, all the time. 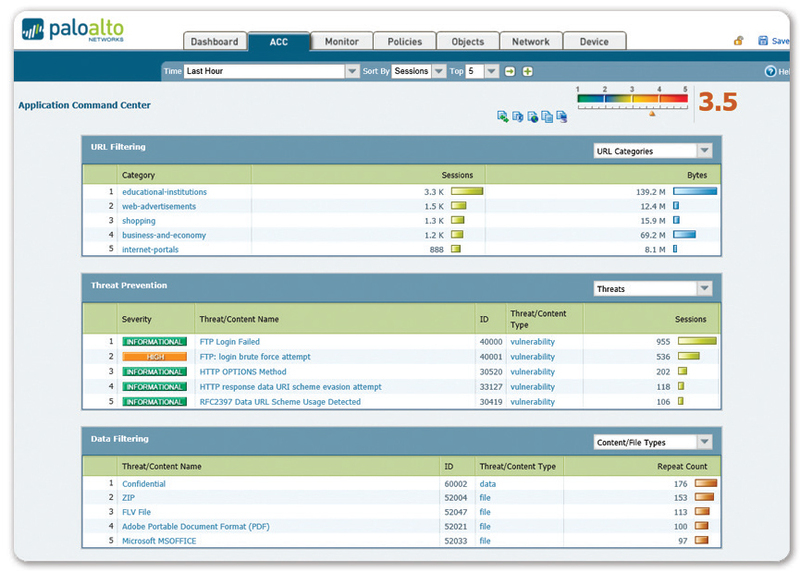 Accurate traffic classification is the heart of any firewall, with the result becoming the basis of the security policy. Today, applications can easily bypass a port-based firewall; hopping ports, using SSL and SSH, sneaking across port 80, or using non-standard ports. App-ID™ addresses the traffic classification visibility limitations that plague traditional firewalls by applying multiple classification mechanisms to the traffic stream, as soon as the firewall sees it, to determine the exact identity of application traversing your network, regardless of port, encryption (SSL or SSH) or evasive technique employed. The knowledge of exactly which applications are traversing your network, not just the port and protocol, becomes the basis for all your security policy decisions. Unidentified applications, typically a small percentage of traffic, yet high in potential risk, are automatically categorized for systematic management— which can include policy control and inspection, threat forensics, creation of a custom App-ID, or a packet capture for Palo Alto Networks App-ID development. Safe application requires a comprehensive approach to securing your network and growing your business that begins with in-depth knowledge of the applications on your network; who the user is, regardless of their platform or location; what content, if any, the application is carrying. With more complete knowledge of network activity, you can create more meaningful security policies that are based on elements of application, user and content that are relevant to your business. The user location, their platform and where the policy is deployed—perimeter, traditional or virtualized datacenter, branch office or remote user— make little or no difference to how the policy is created. You can now safely enable any application, any user, and any content. In the datacenter—traditional, virtualized or a combination thereof—enablement examples are focused on confirming applications, looking for rogue applications, and protecting the data. Safe application enablement means allowing access to certain applications, then applying specific policies to block known exploits, malware and spyware – known or unknown; controlling file or data transfer, and web surfing activity. Common threat evasion tactics such as port-hopping and tunneling are addressed by executing threat prevention policies using the application and protocol context generated by the decoders in App-ID. 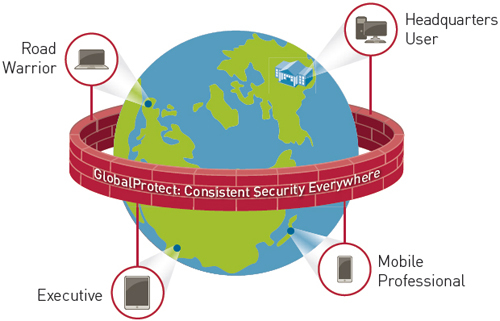 In contrast, UTM solutions take a silo-based approach to threat prevention, with each function, firewall, IPS, AV, URL filtering, all scanning traffic without sharing any context, making them more susceptible to evasive behavior. The underlying technologies within our next-generation firewall form the basis of an enterprise security platform that natively classifies all traffic, on all ports, inclusive of applications, threats and content. 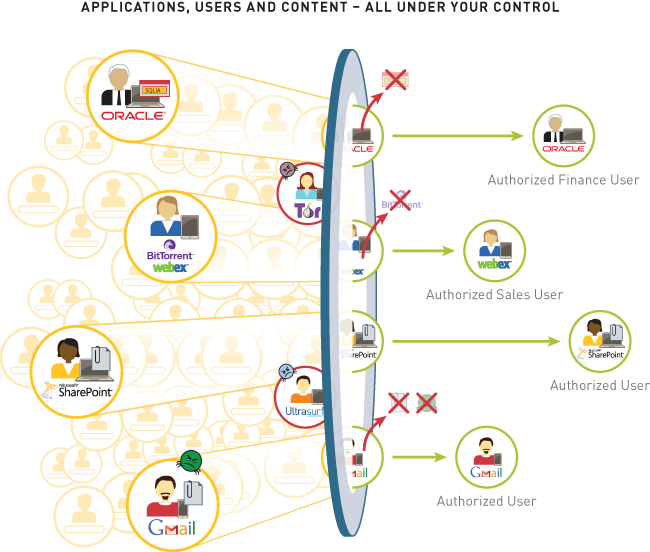 The traffic is then tied to the user, regardless of location or device type allowing you to use the application, content, and user – the core elements that run your business – as the basis of your safe application enablement policies. 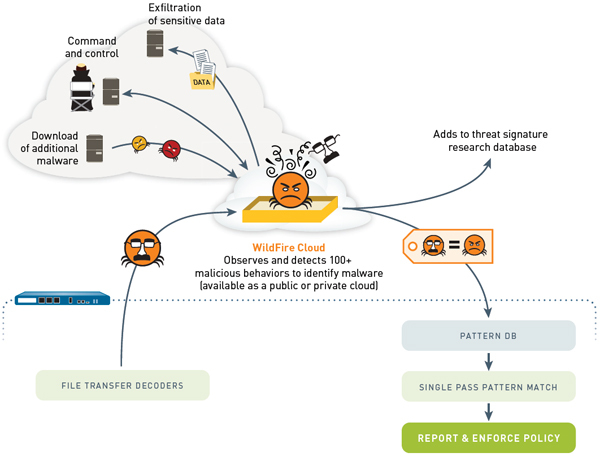 WildFireTM simplifies an organization’s response to the most dangerous threats—automatically detecting unknown malware and quickly preventing threats before organizations are compromised. Unlike legacy security solutions, WildFire quickly identifies and stops these advanced attacks without requiring manual human intervention or costly Incidence Response (IR) services after the fact.